HR&A is proud to announce our selection as lead consultant for Imagine Boston 2030, the comprehensive plan that will define a vision for the future of Boston leading up to its 400th birthday. HR&A will lead an interdisciplinary team of planners, designers and engagement experts, including planning and design partner Utile Architecture + Planning, to develop and deliver Boston’s first citywide plan in 50 years. 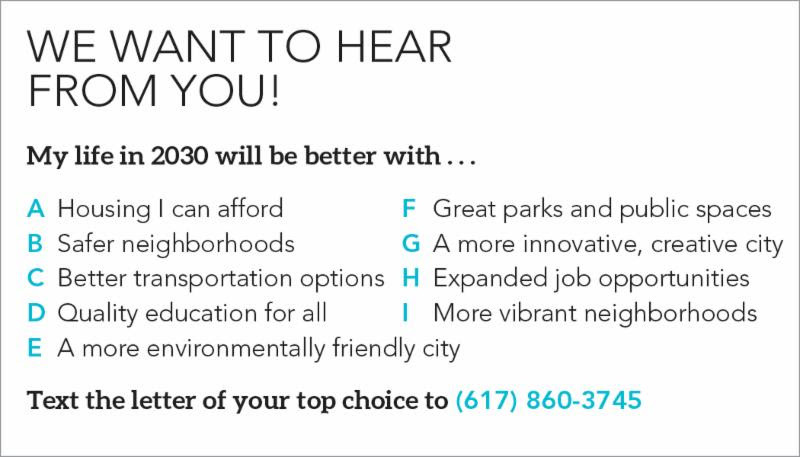 Imagine Boston 2030 will provide opportunities for residents to inform and shape citywide conversations about quality of life, and develop implementable ideas to address the city’s biggest issues. A team of community engagement experts will ensure proactive involvement from diverse constituents through a variety of innovative community engagement channels, ranging from social media and mobile polling to in-person conversations convened and led by local organizations. Guided by feedback from residents and City staff, HR&A and its strategic planning partners will develop a vision plan with goals for the future of Boston’s positive physical change, shared prosperity, coordinated public investment, and a healthy environment and population. The team will work with residents and the City to develop implementable, placed-based initiatives, including identifying timelines, targets and funding sources for attainment of plan goals through 2030 and beyond. HR&A is honored to help plan the future of one of America’s most well-loved cities, and we’re ready to imagine the possibilities of Boston in 2030. Follow Imagine Boston on Twitter @ImagineBos, Instagram, Facebook and our blog.